Riding the Berlin S-Bahn seems to have become a thing among Bard College Berlin students. Some travel the Ringbahn for one hour to visit all 27 stations. Others go for the complete S-Bahn network in one go: 15 lines, 166 stations, 332 kilometres. Some even do it twice. Among them yours truly, who shall try to use the space of this article to convince you this grew neither out of out-right craziness, nor simply out of boredom beyond redemption, by taking you on the journey of how these journeys came about. For that we have to turn back the clock a bit to the warm and lovely days of spring 2014, when I was finishing the second semester of my second year at Bard College Berlin. While thoughtlessly wandering some forlorn corners of the Internet in search of shelter from the essay deadlines that hung like dark thunderclouds on the horizon, I first stumbled on the idea of train transit challenges. A type of underground sport, in both senses of the term, they have gained a small but loyal fan-base in densely populated metropolitan areas with elaborate subterranean train systems, most notably New York and London. In the former, the challenge is known as “the Subway challenge” aka “Rapid Transit Challenge” aka “the Ultimate Ride,” in London it is referred to as “the Tube Challenge.” But the basic idea is the same in both cases: to travel the complete subway or metro network in as little time as possible. Trips of this kind date back to the 1940s in New York when a guy called Hermann Rinke travelled the complete network of his days in around 25 hours. Ever since, new records have been announced on a regular basis, and the fastest attempts for now seem to take around 22 hours. But since there is no official body to regulate the sport there are various sets of rules that each yield different records: some try to travel only every segment of every line at least once, without necessarily stopping at each station. Others try to stop at every station at least once, without necessarily covering every line segment. Some try to combine both, and Guinness World Records has its own set of rules. People have been attempting similar rides in Berlin too and the Guinness record for that is currently at 7 hours 33 minutes 15 seconds. The idea of spending many hours in dimly lit tunnels with bad ventilation never much excited me—understandably, I hope. But trains above the earth I’ve always found fascinating. The first time that I set foot on a plane was after my 14th birthday, and for the first two thirds of my life travelling would happen either by car, or, more often, by train. Twelve-hour trips between Germany and Austria helped me cultivate the skill – admittedly of dubious utility – of staring out of train windows for hours on end without getting bored, letting the mind wander slowly and rest on the ups and downs of hills, fields, and forests that pass by fleetingly, and on the soft monotonous rattling of the train wheels on the tracks. Airplanes, however, always seemed strange to me: one enters some metal cabin after being screened and searched, perhaps catches a few glances of quite beautiful, yet also always distant cloud sceneries. The background noise of airplanes, subtly aggressive, shrill and low at the same time, has nothing of the comfortable quality of the heart-beat-like rhythm of trains. One arrives at an airport – soulless, stressful, and functionalistic shopping-malls mostly, jet-lagged, and not really knowing how one got there or what lands one has passed through. Then starts the long trip back to the city centre. Train stations more often feel like organic parts of a city’s body to me, places with a history and sometimes a nostalgic charm. But it hasn’t always been like that. For the people of the 19th and early 20th century trains and train stations embodied all that airports embody for me: acceleration beyond control, the shrinking of distances in incomprehensible ways, the ‘unstoppable progress’ of capitalism, science, and technology; globalization incarnate. These thoughts had raised a question for me: would it be possible to reach back through history and make amends with trains? Could it be possible for us in the 21st century to use trains – old, slow, and charming – to support and enable a mode of travelling, a gaze, a way of looking at the city, close to the one that both documented and opposed the changes that trains stood for originally in the 19th century – the gaze of the flâneur, that urban explorer who strolls the city in leisure, marvel, attentive curiosity. And a second problem had to be faced: the character of the flâneur sometimes risks collapsing into the character of the dandy, that well-off, cynical gentleman aesthete that inhabited the same urban environments of the 19th century. To ensure that the kind of gaze and practice I wanted to explore – a flâneur’s approach to travelling on a train – was not only possible under the dandy’s material conditions, it seemed necessary to simulate carefully the conditions under which ordinary train users travel: rushing from A to B as quickly as possible. This is where the idea of a transit challenge came in. Aiming to travel the network as fast as possible would put me under the time pressure of the average train user, yet occasionally, in the midst of all the rush I would be looking for moments of repose, contemplation, wonder, and joyful observation and try to capture this experience on camera. 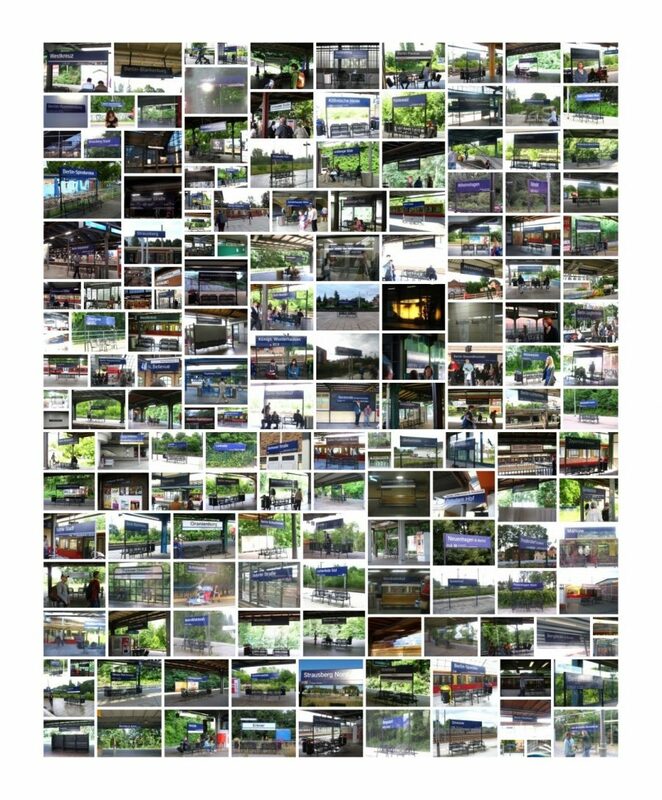 Points of activity (changing trains, running through stations) would mix with points of passivity (waiting for trains, driving long stretches) as the tour would take me back and forth between the centre and the periphery, during night time and rush hour, and everything in between. It soon became clear that the ‘me’ had to become a ‘we’ though. A single person alone would hardly be able to complete the experiment and luckily Diana Plutis (AY 2013) and Irina Stelea (PY 2012) decided to join me for the ride. These were our rules: we had to stop at every station and travel every line segment between any two stations at least once. If there is more than one line running between two stations, it would be enough to cover the segment on one of the lines. All kinds of public transport were allowed that could be used on a BVG one-day ABC group ticket: S-Bahn, U-Bahn, bus, tram, and Regionalbahn, but not, for example, cabs. One person would be filming, one person would take time-stamped pictures of the station name at every stop to document our itinerary, and one of us would write down the times of arrival and departure and calculate new itineraries, in case we had to reschedule. Because of summer travelling plans that each of us had made beforehand, we had just a few days to plan our trip. The mathematics behind finding the shortest route, known as the Chinese Postman Problem, turned out to be super complex and so we had to go with an ad-hoc approach that was supposed to take us through the network in 15 hours and 44 minutes. In the end it took us 17 hours and 1 minute. Zero-minute connections turned out to be infeasible, and it didn’t help that I forgot to factor in toilet breaks. The whole tour was a marathon interspersed with sprints: sometimes you can lay back for an hour and a half, sometimes you frantically look up new itineraries on the BVG app to calculate a new route as you watch the minutes on the clock run out after a missed connection. For a long time nothing happens and then everything happens at once. Writing down arrival times every two minutes gives you another very different experience of time: an hour doesn’t feel like less or more than an hour, but time gets a certain heaviness when you cut it into slices with your pen in such a steady rhythm. Usually we had only seconds to take the pictures of the station names at each stop and each time we needed to decide anew: step out, run over to get a better angle, with the risk of not making it back in time? When we finished the tour at 10.24 pm happiness mingled with utter exhaustion. But we got to see, and film, a beautiful sunrise and later an equally glorious sunset, and the day had sun, clouds, rain, storm, and hail to offer us, which made for a wonderful scenery. Moving back and forth from the outskirts to Mitte, from the early morning to the late night hours gave us a whole new experience of the city. And then we tried it again. 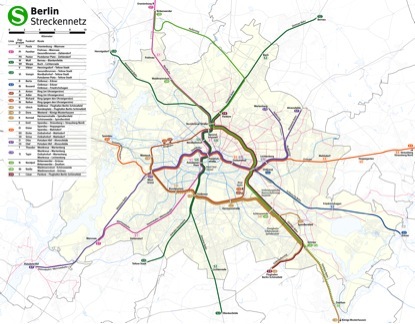 A journalist contacted us who had read about our attempt on an online forum for tube challenges and wanted to know more about the “Berlin scene” of transit challenges. Following the advice of former ECLA professor Steve Maurer, I had also told math professors at the Zuse Institute Berlin (ZIB) about the attempt and they got me in touch with one of their students, Loes Knoben from the Netherlands. During the fall of 2014 she worked for many months on an algorithm that would yield a new optimal itinerary, which would allow us to make the trip in 13 hours and 44 minutes. On January 10th, 2015 Diana, Loes, Isabel Beckenbach (math PhD at ZIB), Niels Lindner (math PhD at HU), and I, with part-time support from Irina, tried it again. For some time we were even ahead of schedule because we made one “impossible” zero-minute connection, and it looked like we could finish the tour in 13 hours and 24 minutes! Alas, hurricane “Felix” intervened and blocked a few lines by throwing trees and construction site scaffolds on the tracks. In the end we nevertheless finished the ride – in 15 hours and 4 minutes. Negotiations with Guinness for official recognition are set to start soon. Record holder for the New York Subway Challenge, Adham Fisher, who also travelled the complete Berlin U-Bahn before has expressed interest in joining for further attempts. Perhaps one day we can try again for the perfect ride? Wow, what an adventure!! I reside in Columbus, Ohio, USA and we don’t have a local train system, but reading your blog entry made me really sad that we don’t. It must be quite an awesome experience taking in the sites and sounds of your city while racing against the clock in such a unique challenge. Not to mention that even in the 21st century, trains are by far the superior mode of local public transport. I wish you success on your future attempts at achieving Berlin’s perfect ride!